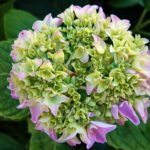 I received a hydrangea plant from a florist and two days after I got it the leaves started dying. All the leaves are turning brown and brittle. I only watered it when the plant was drooping even though the soil was still moist. Then I repotted it in dry soil and did not water until it started drooping again. Would it help if I remove the leaves off of the plant? Would it make new leaves or would it stress the plant out to much? 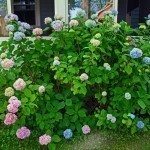 Hydrangeas need to be kept unifromaly moist, but not soggy. It is a good idea to check the soil with your finger and water if it feels dry to the touch about an inch or so. If it's still moist, do not water. You can remove the browning leaves and they should regrow once the plant recovers.